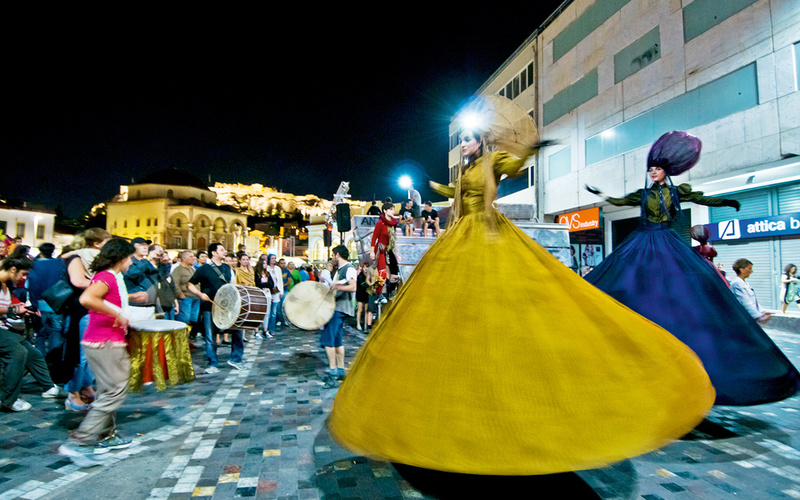 There's always something lively and unusual to see in Monastiraki. 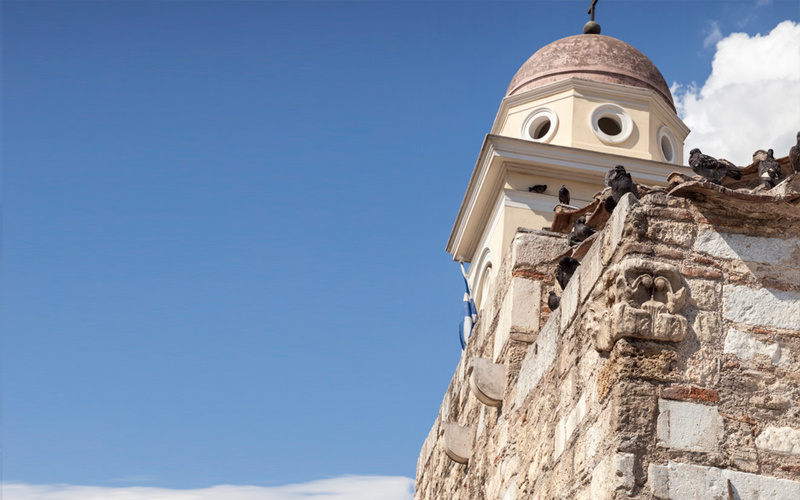 Pandrossou is a relatively broad street linking Mitropoleos – named after the imposing Greek Orthodox Metropolitan Cathedral – and Monastiraki Square. At the top end of the street, you may see idle shopkeepers whiling away the hours over cups of coffee, lamenting the drop in their business. Further down, a hodgepodge of commercial establishments sells furs, elegant gifts, knock-off soccer jerseys, plenty of tchotchkes and the predictable tacky souvenirs. At the lower end of Pandrossou, one usually finds Monastiraki Square in a state of bedlam, with crowds of people waiting to meet their friends or just hanging around, while the odd drum circle or group of Peruvian flute players adds to the din. 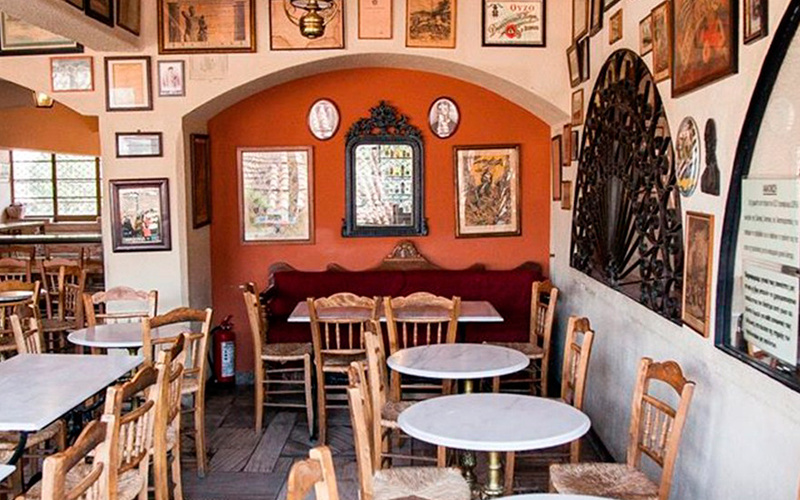 Monastiraki offers an excellent demonstration of the fact that old and new live hand-in-hand in Athens. The square itself is home to an historic train station built in 1895 that now accommodates the metro system, a mosque from 1795, a small Christian church dating from the 9th-11th centuries and the remains of the Roman emperor Hadrian’s 2nd century AD library or forum. The old station, today used by the ISAP electric railway, marked the first stream-train link between Pireaus and central Athens. It was instrumental in boosting commerce by getting merchandise to and from the port fast. 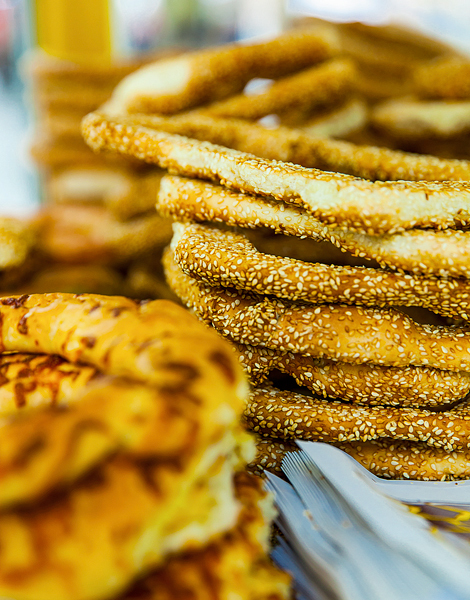 Try a "koulouri" - a favourite Athenian snack - either with or without sesame. 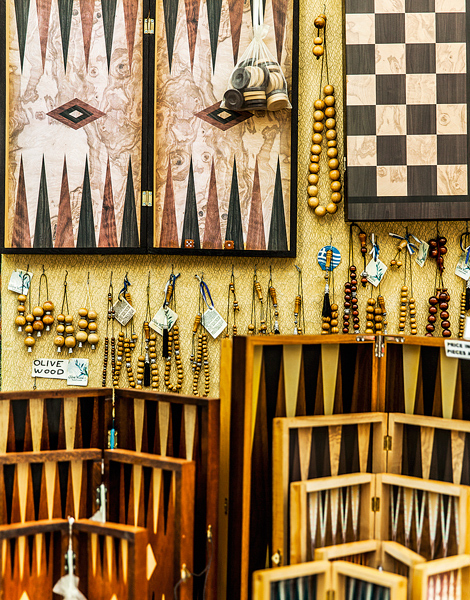 Backgammon boards and worry beads come in all shapes and sizes in Monastiraki. 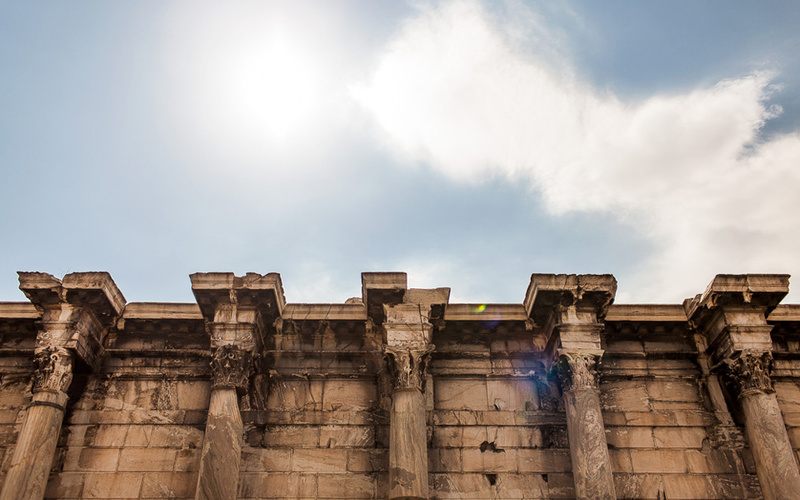 Corinthian columns mark the western end of the Library of Hadrian (2nd cent. AD), once a large public forum, with strolling paths, decorative statues in niches, a library and two lecture halls. As much as we like to complain about our changing world, Ifestou Street – named after Hephaistos, the god of metalworkers – and Avyssinias Square still have something of their old mystique. The shops may no longer sell beautiful antiques, but the new objects have their own charm and the reproductions of old furniture are quite good. Tiny side-streets like Kynetou and Normanou, meanwhile, offer small pockets of tranquility that appear to belong to more innocent times. Ifestou seems narrow because of the masses of merchandise displayed on both sides of this street, which represents the heart of the so-called Monastiraki Flea Market. Athenians have always said that you can find anything you want here and this may well be true. We spotted the following incongruous items: beads, sportswear, handmade soaps, hats, sandals, military uniforms, bicycles, furniture, dinner sets, old buttons, hardware, works of art, Karagiozi shadow-theater figures, vinyl records, decorative items, toys, knick-knacks and much, much more. We even saw a man selling canaries. We asked around for a shop that sells handmade tsarouchi clogs – the red shoes with pom-poms, today worn by Greece’s Presidential Guard but historically by 19th century Greek soldiers – and were told about Dino, the best craftsman in town. Soon we found him in a small basement at 26 Ifestou and had a fascinating chat about his usual and not-so-usual products. 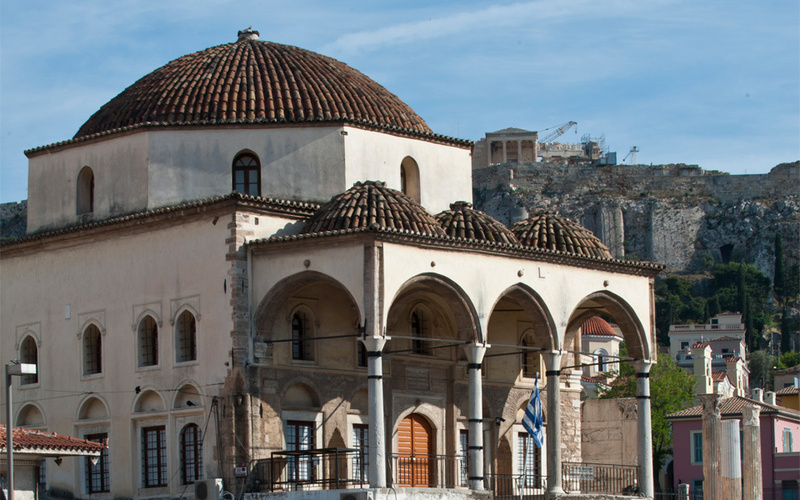 At Avyssinias Square – once a center for antique auctions, first organized by a Greek Jew from Asia Minor in 1910 – you no longer find an abundance of antiques; but, with patience and a good eye, you may spot an attractive souvenir. In recent years, the square – likely named after the area’s former Ethiopian (Abyssinian) community – has become more a center of leisure, with two cafe-bar-restaurants already in place.